LONDON--(BUSINESS WIRE)--The global LED industrial lighting market is expected to grow at a CAGR of close to 9% during the period 2018-2022, according to a new market research study by Technavio. The report presents a comprehensive research of the global LED industrial lighting market by type, which includes lamp and luminaire. The report also determines the geographic breakdown of the market in terms of detailed analysis and impact, which includes key geographies such as APAC, the Americas, and EMEA. A major growth driver for this market is the ban placed on the use of halogen lamps. Many countries around the world have placed bans on the use of halogen lamps to boost the growth of LEDs for their inherent energy-saving feature. Halogen lamps consume much more power than LEDs. They also have a larger carbon footprint. The governments around the globe have passed several measures to phase out incandescent light bulbs for general lighting and focus on energy-efficient lighting alternatives. Fluorescent lighting is used in industrial applications and warehouses. Fluorescent lamps also are used in manufacturing plants for high-bay and low-bay lighting. CSP LED lighting module is a LED module in which a single chip has a direct-mountable package that is the same size as the chip. CSP LED lighting modules are a revolution in LED lighting owing to their small size that makes them viable for many applications such as spotlights and downlights. CSP LED lighting modules are gaining momentum in the global LED market primarily due to features such as increased power density at a smaller surface and the optimal use of the LED. The low form factor of a CSP module, along with a wide beam angle, permits the module to be used in floodlights, spotlighting, and downlight applications required for industrial lighting. The initial cost required to integrate LED lighting into manufacturing plants and production facilities is exorbitant. This prevents firms from integrating LEDs into their plants, and these firms prefer other types of lighting such as CFL, LFL, and HID. These end-users prefer the use of traditional lighting sources over LEDs as they have a lower initial cost. The assembly process for an LED is carried out manually as it is a complicated procedure. A clearly defined standard procedure for manufacturing LEDs on machines has not yet been developed. 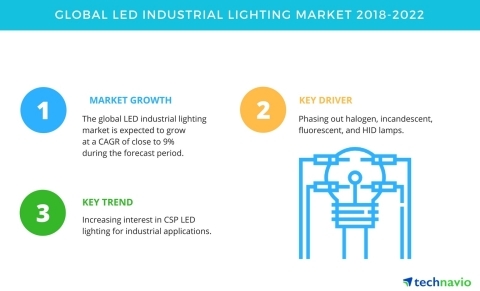 The global LED industrial lighting market is expected to grow at a CAGR of close to 9% during the period 2018-2022, according to Technavio.